Morocco Travel – What was different? ues are clear, brilliant, crisp, and clean. The buildings ocre, terracotta and beige are the backdrop colors for brilliant cerulean blue, oranges, purples, aquas, and pinks. The spices piled up on street contributed to the vivid color palette that is Morocco. Various dazzling blues and greens pop in the gardens at Marrakech, especially the Jardin Majorelle, where the deep cerulean blue is said to be taken from the sky. Morocco presents various different environments, from Old Cities, like Medina from 700-800 AD, an UNESCO site with streets from the same time period, and people living in houses built back then, to desert towns, and major cities. The cities are a stark contrast to the vast beige of the desert, and winding stone, green, and terracotta mountain passes. The huge 2,000 meter high mountain passes reveal hairpin turns built as switchbacks. The mountains are dotted with tiny farming villages where you pass people herding sheep. You get a sudden jolt from the collision of modern technology and old time life style, where cows ride on top of the trucks as you drive through the mountains. Their plane touched down in Casablanca, and after being met by a private driver, Gail and Mitch are off on a 3-hour journey to Fes for 3 nights, their first stop in Morocco. Fes is the country’s cultural capitol, known for the walled Medina, an UNESCO World Heritage Centre. It is a feast for the eyes with colorful souks (markets or bazaars), and Marinid architecture, which is characterized by sculpted stucco and wood with tile facades and courtyards. Another interesting fact about Fes is it is home to oldest University in the world. From Skoura they traveled to Zagora the last city before entering the desert. 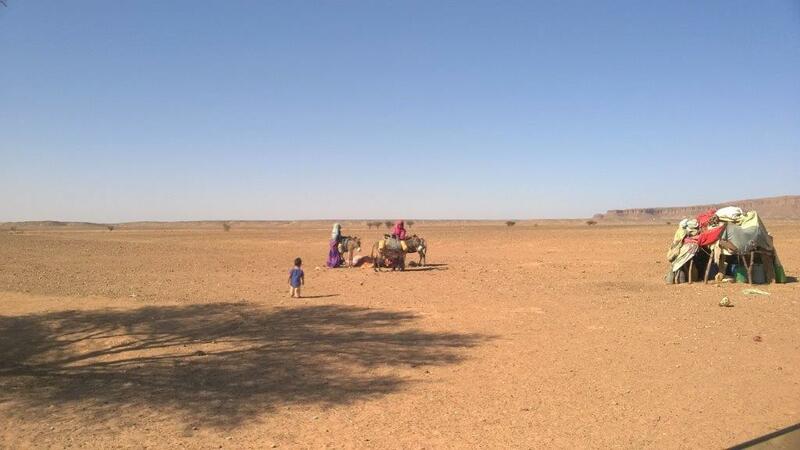 Zagora is the last outpost of civilization; a good place to hire a desert guide. The road trip traveled along the Draa river, which is surrounded by greenery with the desert backdrop, on their way to a more remote part of the desert than tourists usually visit. The destination — Erg Chigaga in the Sahara Desert. After a 6-7 hour drive from Skoura, they arrived at the end of the road where the driver knows the desert track to follow to a camp in M’hamid, which is another drive 1½ hours into a vast nothingness of sand. 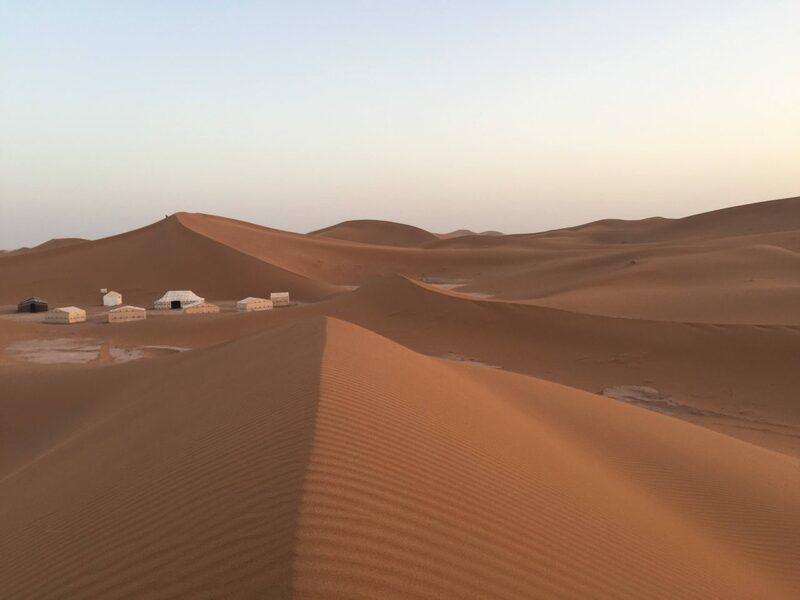 The camp in Ma’hami is set next to the ‘Dune’ – one of the biggest dunes, Chigaga. Sights along the way treat you to camels, sunsets, red sand expanse, and little camps throughout the region. It is you and the Sahara Desert. You can travel without a guide, as there are signs, but you drive into very hot nothingness. It would be a terrible place to get lost. 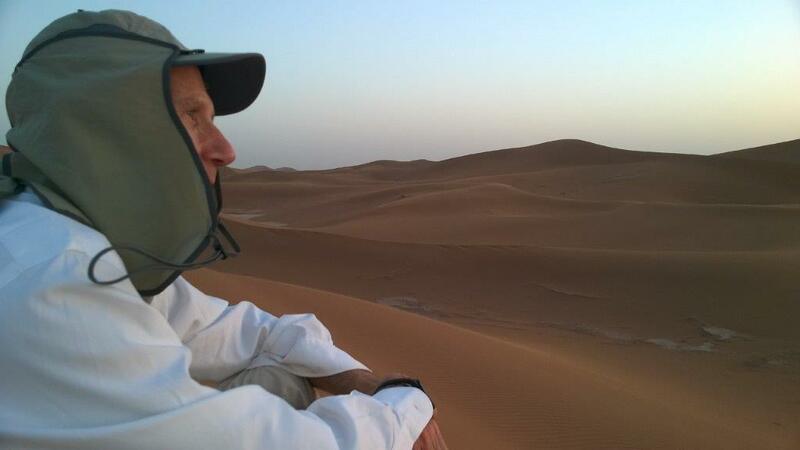 Their guide was an indigenous man, a Berber, who knew his way through the vast desert . He only spoke French and Berber, so Gail and Mitch used their high school French and phone translator; it worked – they understood each other. As part of the desert visit, they drove to a nomadic Berber family and shared tea; their guide served as interpreter when necessary. Drinking tea is a norm in Morocco. The nomad families have a meager lifestyle, and tea time is a part of it. While the 4 children were adorable, they were filthy. The children carried a baby goat over for Gail and Mitch to pet. They sold bracelets and made crafts to sell to supplement their income. They really have nothing, so tourists are expected to buy, and to leave any unwanted clothes. All of this desert trip was selected by Gail and the owner of L’Ma, the hotel owner from Skoura who Gail found on the internet who coordinated all of it. Using the owner of L’Ma to schedule and coordinate their travel kept the trip price reasonable. When you think Morocco, you think Marrakech, so Gail had to include Marrakech in the trip. It was a very long drive from the desert to Marrakech, but their remote Sahara camp was the closer desert camp to Marrakech. Along the drive they traveled through the highest point, Tizi n’Tichka, a High Atlas mountain pass (https://en.wikipedia.org/wiki/High_Atlas). Tizi n’Tichka is the highest mountain in northern Africa, which links Marrakech to the Sahara desert. Upon arrival in Marrakech, at first glance, it feels like Fes. Yet, it differs, as it is a much bigger southern city with winding streets, more palaces, and more artisan areas. They had 4 days in Marrakech where they walked to the square each night and visited the inexpensive food stalls, but only the ones recommended by the hotel. Days were filled by visits to old palaces, Bahia – an old walled city with storks nesting on it. Bahia had housed the ruler’s harem. 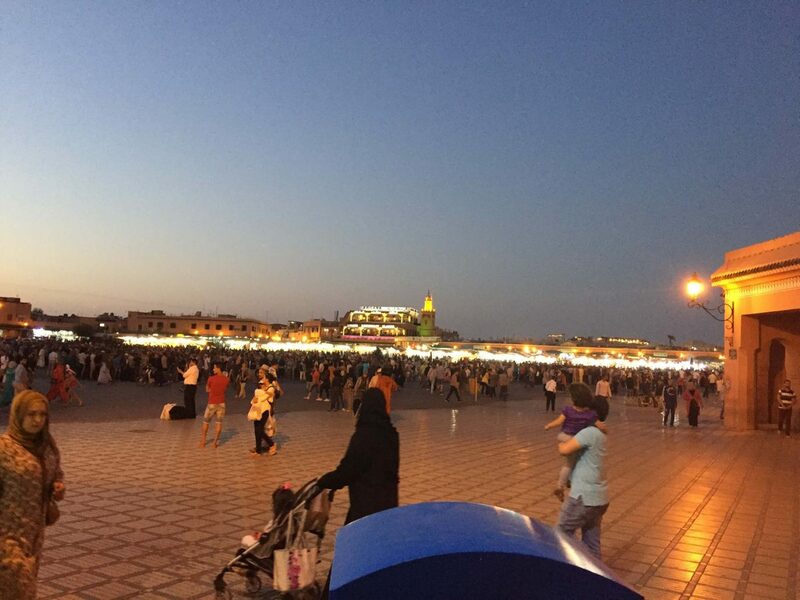 Visits to Place Jemaa El Fnaa, a large square, the ‘Center’ meant snake charmers, belly dancers, food stalls, a mosque, with the city buildings surrounding it. It is a great place to visit where you can sit, watch, and shop. It’s huge and filled with people of many different nationalities. 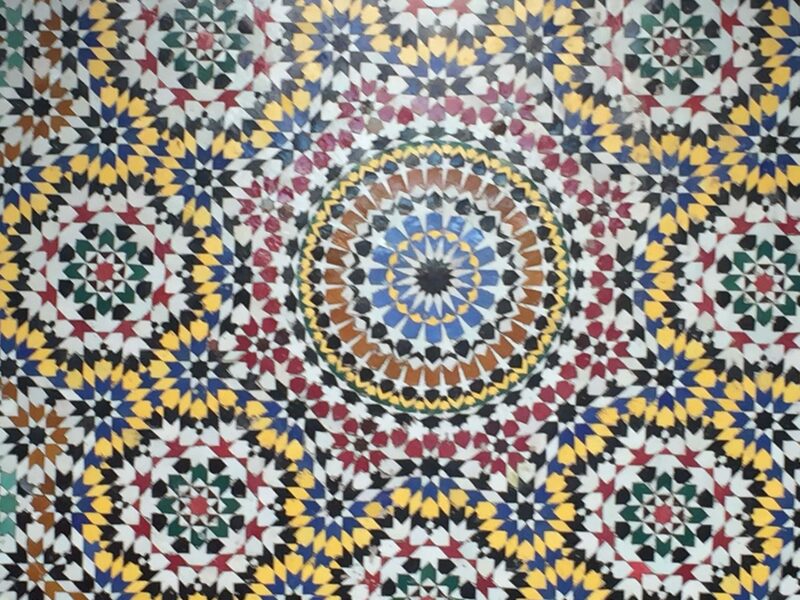 They visited old Saadian Tombs with beautiful mosaics. The Tiskiwin Museum was a destination with artifacts and clothing of the indigenous Berber people who originally came from the Sahara bringing their culture with them. While Morocco had persecuted these people, they are now trying to honor the origins of the people. 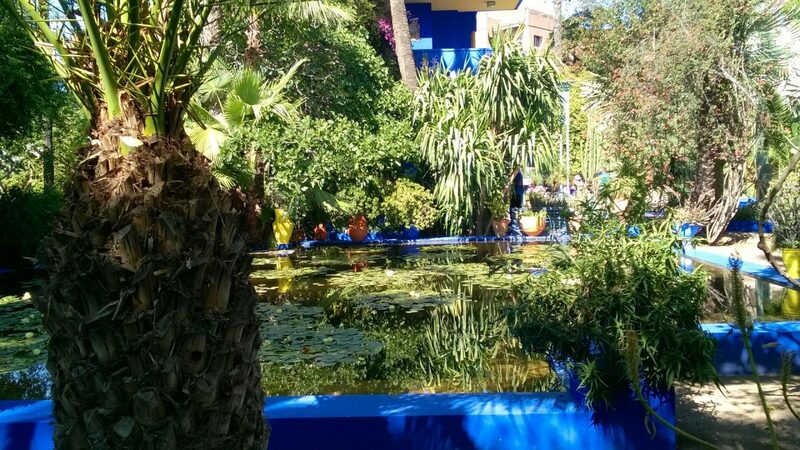 One of the special places in Marrakech is Jacques Majorelle home. He came in 1917 and purchased a palm grove where he created gardens, and had an artist studio built. It is the most visited tourist sight in Marrakech. In 1980, Yves St. Laurent and Pierre Berge bought it, and saved it from real estate development. The draw for Gail was the textiles and the gardens. “Each garden layout was more gorgeous than the last. It was like walking into a painting. Pictures don’t do it justice.” There are lush plants from all around the world with water features, pools and fountains. A collection of Berber clothing and jewelry are housed at the garden; they are inspirational in textures, colors and forms. This is a must see!!! The majority of accommodations Gail selected are considered moderate to upper at $250-$300/per night. In Morocco, there are a lot of old houses, or small palaces called ‘Riads’ that are converted into small hotels. They range from a converted large home to a big palace. Riads are available at all different price levels. Their hotels in both Fes and Marrakech were in the Medina in an old building, surrounded by walls enclosing a courtyard. Rooms are situated around the courtyard. Fountains adorn the courtyard. The Fes Riad was a gorgeous converted old palace with a small swimming pool, and a spa on site. Gail explains the Fes accommodations as wonderful, providing great bath salts and special facial mask in each room’s bathroom. The hotel has a huge atrium done in mosaic and a rooftop bar that overlooks the city of Fes. This lovely Chateau was $250/night, with dinner and breakfast. They spent 4 days in Marrakech staying at a hotel with pool, Le Jardin de la Medina. The pool was great to cool off at end of a day of sightseeing. Le Jardin offers a spa and cooking school. 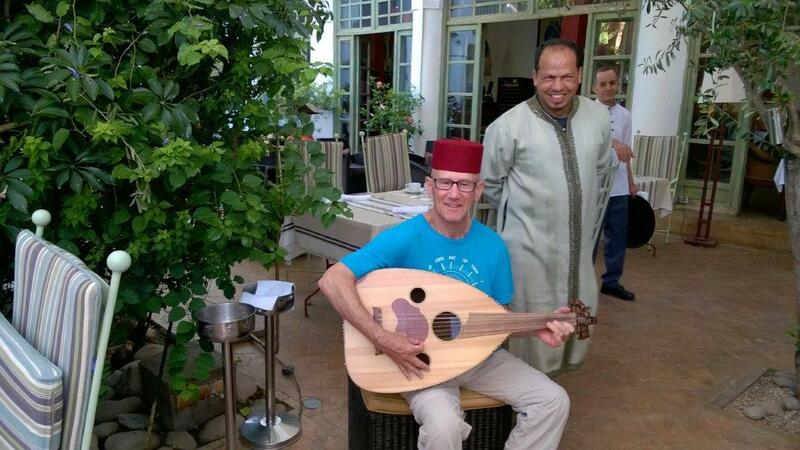 In the morning during poolside breakfast, a lute player serenades you. For the Desert and Draa Valley excursion to Skoura and beyond, they had a driver, somebody who knows the roads and language. This part of the trip was arranged by the company L’ma owns. A full package was provided. For just 338/EU pp, they had an airport pick up, their stay at L’ma, the desert trip all the way to Marrakech, one night at a desert camp in a private tent, their meals, a visit to a nomad family, private transportation to Marrakech, a driver and guide. L’ma, their hotel in Skoura, was like a little oasis at the height of hospitality and comfort in an unassuming way. You can enjoy the lovely garden or relax at the pool at the end of a hot day on rugs and pillows on the rooftop while watching the sunset. The owner makes the breads, grows wheat, makes various fresh sweet, delicious toppings for breakfast crepes, and the hostess treats each of her guests as someone very special. Know what you want to see and tailor the trip since there is so much to choose from. Ask your hotel if someone can pick you up at the airport. They paid $150 for the private transport. Ask people for help. People are very helpful and they will help you with whatever you need to know or want. Be aware of pickpockets in the cities. Carry bags and backpacks in front. Use cell phones for text only to keep costs down. Wifi is available in the desert. Everything was very clean, and there is running water. Carry toilet paper. While most places have it, and some do not. Sign up with your State Department in case of travel issues. Gail felt totally safe. There are check points with Moroccan soldiers who check the vehicles and question drivers and passengers. They found that the people are proud of their country and happy you are visiting; they are warm, welcoming, and service-oriented. It took Gail 2 months to research and plan this trip. It was a fantastic experience. I hope some of this information and links help you plan your trip. This entry was posted in Fes, Marrakech, Morocco and tagged Accommodations, Art + Architecture, Art Adventures, Bahia, Chigaga, color palette, colorful souks, craft guilds, Cultural Adventure, Culture, Draa River, Erg Chigaga, Fes, Fez, Food, International Travel, Jacques Majorelle, Jardin Majorelle, Jemaa El Fna, kasbahs, Land Adventures, Marrakech, Marrakesh, Medina, Morocco, Outdoor Adventures, Riad, Saadian Tombs, Sahara Desert, Skoura, tagine style cooking, Textiles, Tiskiwin Museum, Travel, UNESCO site, Yves St. Laurent by Wendy. Bookmark the permalink.